It started a long time before the industrial revolution, manufacturers extracting water from local rivers and streams, and the process is still commonly used today, in applications from energy generation to paper making. Unlike their forebears, however, modern systems inevitably include various treatment processes to ensure the extracted water meets appropriate quality, safety and process control standards. nrw Anlagentechnik, based in Hückelhoven, Germany, specialises in the production of stainless steel products for water and wastewater treatment in a wide variety of municipal and industrial applications. The company has developed a range of vertical screens that are used to address one of the key challenges inherent in river water extraction: solids. Natural river water carries a wide range of materials, from algae and plant debris to aquatic fauna. All this material can be removed by filtration, but doing that puts additional load on treatment equipment, consumes energy and creates a waste stream that must then be handled by the operator. Far better to ensure that such material is prevented from entering the treatment system in the first place. nrw Anlagentechnik vertical screens achieve that objective using perforated stainless steel elements immersed in the water at the extraction point to prevent solids above a certain size from entering the water supply. Depending on the application, the screens use perforations of between 1 mm and 20 mm diameter. To ensure the screens do not become blocked over time, a system of rotating polypropylene brushes keeps the outer surface of the screens clear, returning debris safely and continually back into the water flow. For many years, nrw Anlagentechnik, has specified Bauer gear motors to operate its vertical brush systems. The Bauer gear motors provide compact, robust, and reliable operation, delivering the required low rotation speed – typically less than 2 revolutions per minute – without the need for secondary powertrain components. In river water extraction applications, the ability of the motor system to cope with demanding environmental conditions is of paramount importance. Not only are the gear motors mounted in a position exposed to the elements and just a small distance above the water surface, but in some installations seasonal fluctuations in the water level can mean the entire installation is periodically submerged, usually during seasonal floods. For these applications, Bauer, part of the Altra Industrial Motion Corporation, supplies special IP68-rated versions of its motors, which are fully submersible and impervious to water and dust ingress. In an installation in South Germany, for example, the customer specified three Bauer BF40Z-04W series units, with a power rating of 0.12kW. 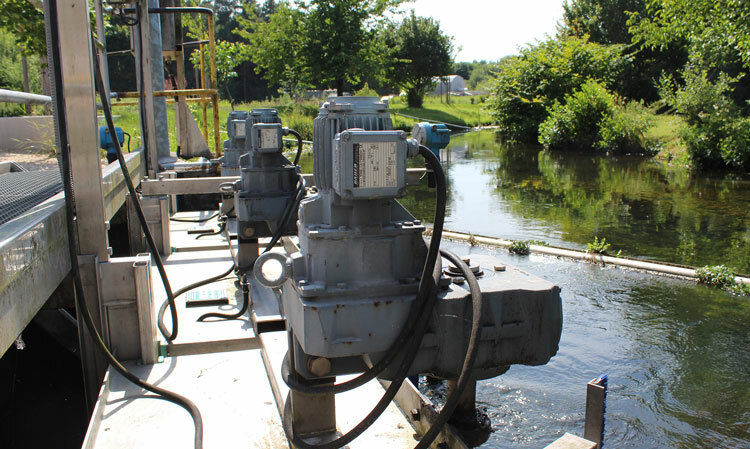 The motors were supplied in the IP68 configuration, with a special paint finish, fully compliant with national Water Industry Mechanical and Electrical Specifications (WIMES). What does system integration mean for Industry 4.0?